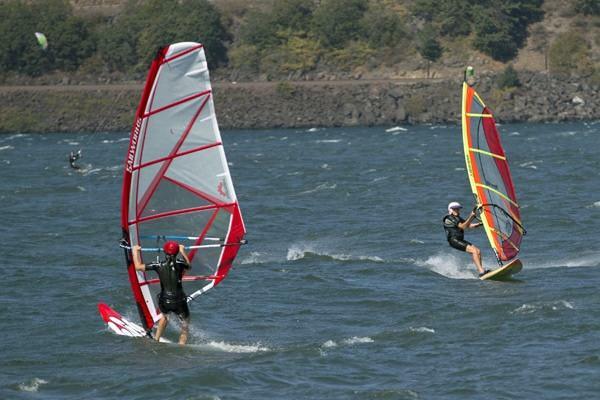 Wake up in paradise, Hood River, the windsurfing capital of the world and the perfect place to linger during a tour of the Gorge. 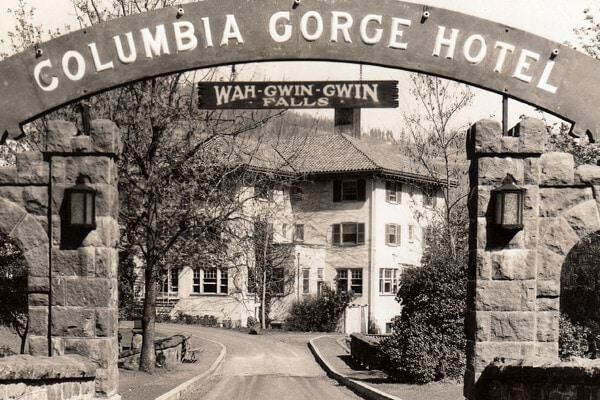 If you spend the night in the Columbia Gorge Hotel (N4), a 1920 historic landmark frequented by old Hollywood stars and presidents, grab a great view of Wah-Gwin-Gwin Falls, the second-highest waterfall in the Gorge. 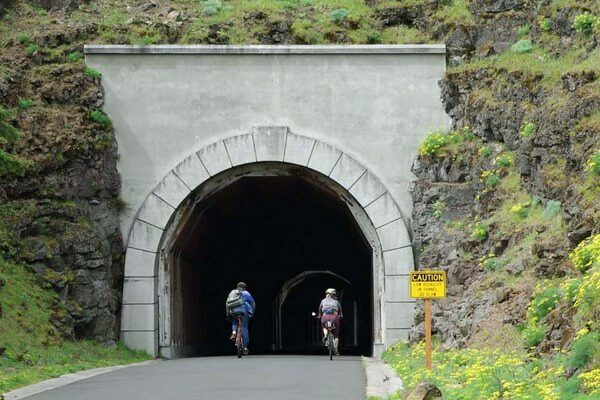 From Hood River to Mosier, the next 7 miles of the historic highway are part of the State Trail, paved, car-free and perfect for cycling or hiking. Anyone who enjoys the Columbia River Gorge National Scenic Area owes thanks to former Oregon Gov. Mark O. Hatfield who successfully advocated for the National Scenic Act. Learn more about his contributions at the Mark O. Hatfield West Trailhead and Visitor Center (O2). Look into the nearby rock quarry for the glacial erratic rock (N1), a light-colored granite rock that floated here from Montana during an Ice Age flood. 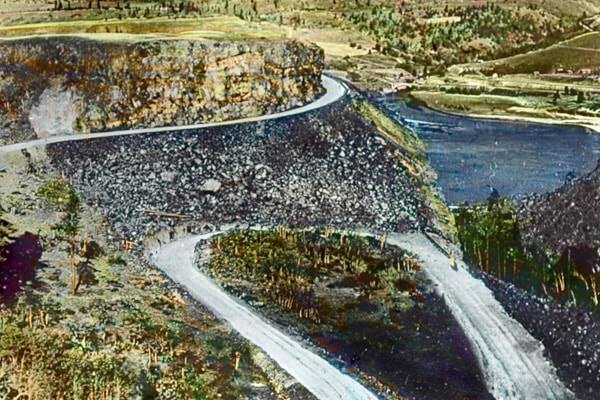 Another must-see here is the Mosier Twin Tunnels, an iconic historic highway stop that was covered in rubble for some 50 years before reopening in 2000. Try to locate the hidden Mosier Twin Tunnels message (G2), carved into a wall by people trapped in a snowstorm in 1921. In Mosier, snap a selfie with the Mosier totem pole (I1), a 50-foot beacon depicting the town’s history. Then take the 182-foot-long Mosier Creek Bridge (G4) to the Mosier Pioneer Cemetery (B2), where you’ll find gravesites dating back to 1929. 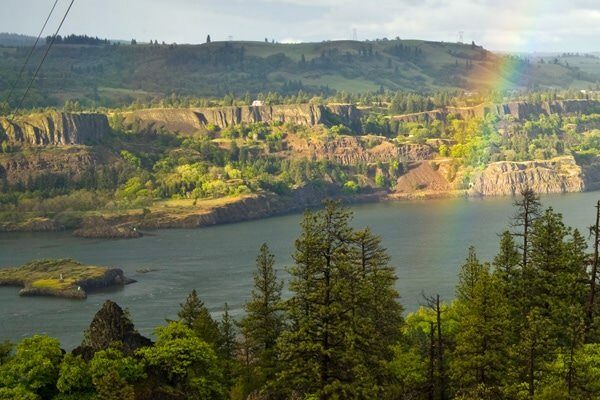 From there, it’s a pleasant walk to Mosier Creek Falls (G1) and the summit of Mosier Plateau (O3), where you’ll be treated to some of the best views in the Gorge. Less than two miles east of Mosier is the Mayerdale Estate (B5), a 1913 farm now home to Garnier Vineyards. Needless to say, it’s probably a good idea to stop by the tasting room. Your next stop, Memaloose Viewpoint (B1), deviates from the historic highway but is well worth the detour in spring when it abounds with wildflowers. Look below to Memaloose Island, a former indigenous burial site surrounded by water. 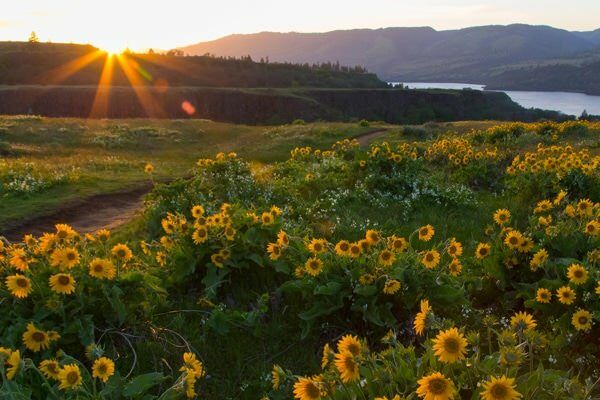 Back on the historic highway, don’t miss the Tom McCall Nature Preserve (I3) at Rowena Crest, named after Oregon’s beloved former governor. Located in an unique climate zone between the forested Cascades and drier grasslands, the preserve is home to rare plant populations and only open May through October. At the Rowena Plateau Overlook, glance down at the iconic Rowena Loops (B4) where the highway descends 500+ feet in 2 miles. You’ll also find some ancient marvels on the Rowena Plateau, two kolk ponds (G5) created by strong Ice Age whirlpools. 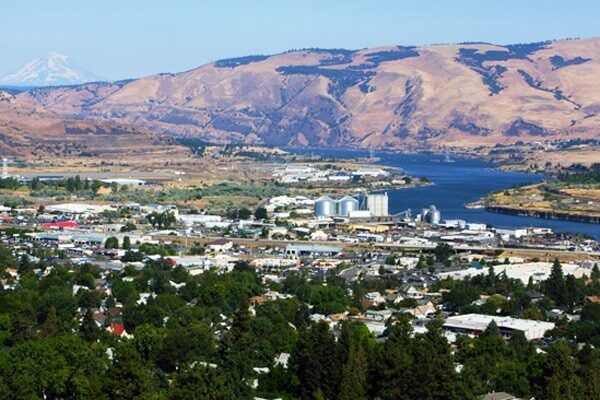 Learn more about the region’s multilayered past at the Columbia Gorge Discovery Center in The Dalles. Near the museum exit is an east entrance sign (N5) made of rock and wood. 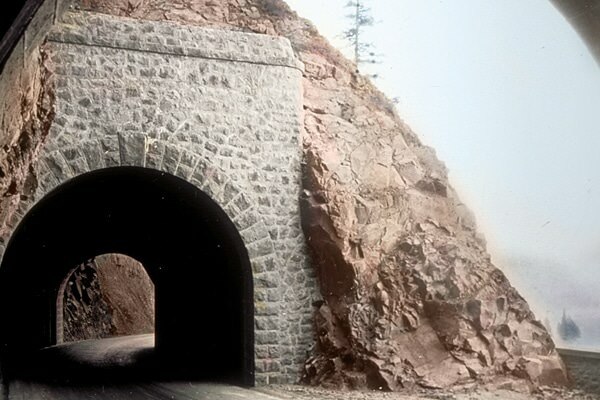 The eastern section of the historic highway didn’t open until 1922, six years after the rest of the route. The Dalles is chock-full of history, so much so that you’ll want to grab a map of historic buildings (I4) at The Dalles Chamber of Commerce. The easiest to find is the Old St. Peter’s Landmark, a restored church in the heart of downtown. Bonus bingo squares include a beauty shot (N3), ponderosa pine (O5), changing leaves (O1), an eagle (I2), oak trees (B3), a train (G3), a fruit orchard (O4) and a vineyard (I5). Congratulations, you completed Historic Highway Bingo. And by doing so you’ve witnessed the diverse beauty of the Gorge and this famous route. Celebrate the “King of Roads” beyond its 2016 centennial by revisiting these sites (and more) and by being a steward of the land so it can be enjoyed by generations to come.